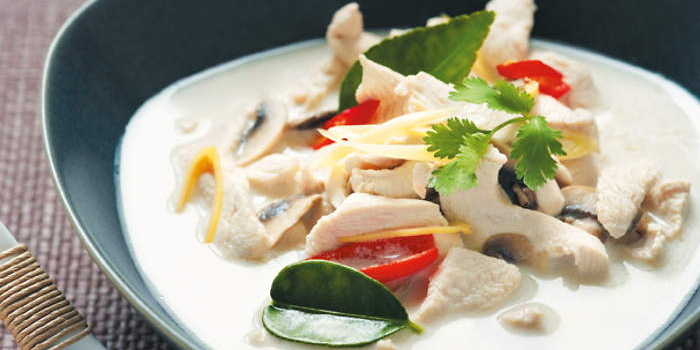 Tom Ka Gai (ต้มข่า ไก่) is a coconut chicken soup combining the taste of lime leaves, lemon grass and galangal. Galangal can look similar to ginger but with the difference that while ginger has a warming effect, galangal has a cooling and a refreshing, almost smoky taste. You do not need to peel it, but just use the main part of the galangal and offshoots. You can also freeze galangal before cutting it into slices placed separately on the plate, and then freeze them in a bag for future use. 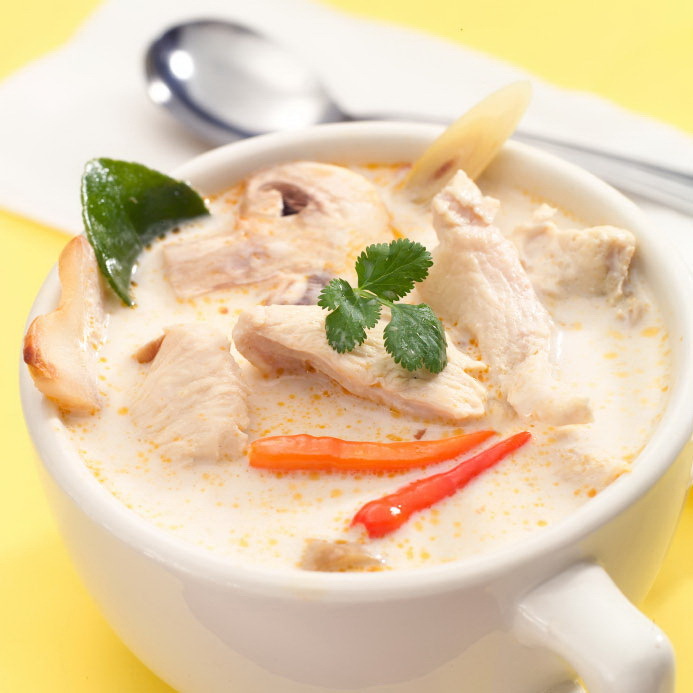 In the 19th century, Tom Kha was not soup, but it was the dish of chicken or duck in a light coconut broth with plenty of galangal, served with roasted chili paste for dipping. Cut the chicken into 6 mm strips and set them aside. 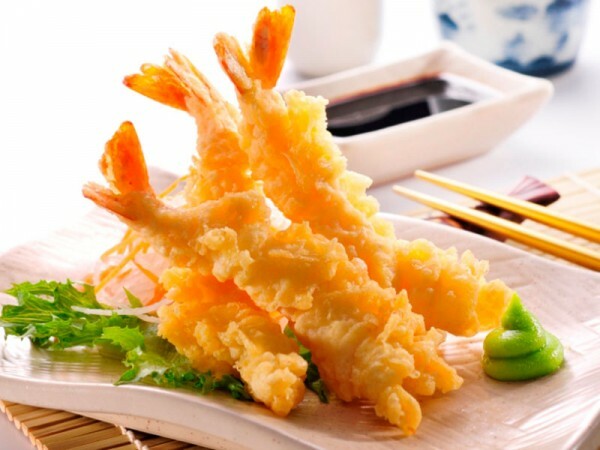 Squeeze lemongrass against a board with the blunt side of a knife. Cut it into 6 cm pieces. Cut the galangal into 3 mm slices, tear the lime leaves into thirds, cut the chili into halves, remove its seeds and set them aside. Put the coconut milk and water (or chicken broth) to a medium-sized pot and cook over medium heat. Cook for 2-3 minutes, but do not let the soup boil. 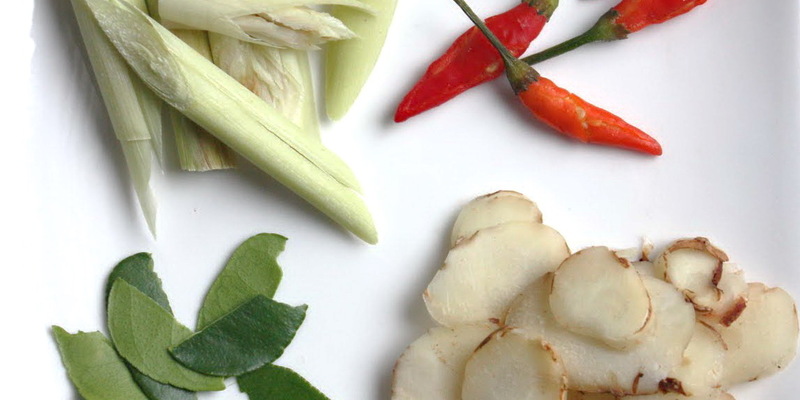 Reduce flame to a low level and add lemon grass, galangal, lime leaves and chilli. Cook for 2 more minutes while constantly stirring. Add chicken and cook while stirring for 5 minutes. Be careful not overcook the chicken and reduce the temperature if the soup is close to boiling. Finally stir while adding the lemon (or lime) juice, fish sauce and sugar. Garnish with coriander and the soup is ready. Video recipe for a different version of Tom Kha Kai - with mushrooms.